The Japanese Camellia has soil requirements that are similar to that of Azaleas, acidic and well drained, and are not very tolerant of salty soils. The foliage is dark glossy green with thick leathery leaves. The main attraction of Japanese Camellias is the winter flowers. The Victory White Camellia blooms mid season with medium sized semi-double to loose peony-like pure white blooms. 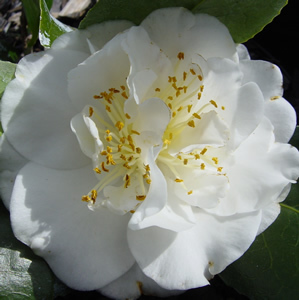 Camellia japonica ‘Victory White’ has a vigorous growth rate with an upright growth habit.